I throughly enjoyed my stay at Ginger House Plovdiv. I stayed in a 6 bed dorm and a private room. 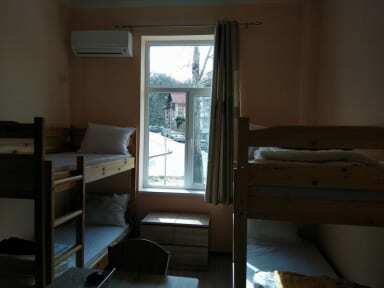 The hostel is in a safe location and is off a main road so its great for transport links. The hostel is very clean and modern as it has had a recent refurbishment. There is one shower and two toilets but as its a small hostel it is not an issue. Velin is very hospitable and always answered my questions. The hostel is very chilled and quiet - its perfect for those seeking rest and relaxation. Awesome! Stayed here all four times when I returned to Plovdiv. Perfect place to stay, but NOT a party hostel. This is an amazing place for travelers 30,+ of age. The hostel is comfortable, clean, quiet but the best part is that the owner makes things easy for you. Loved my stay here. The owner is amazing and goes out of his way to help. Small quiet hostel which was perfect for me. About a 15 minutes walk from the south bus station and easy walk to old town. Facilities were great and kept very clean. Wonderful breakfast. If you’re after a cosy hostel - this is the place to go in Plovdiv. Super friendly small hostel with just one dorm. Very clean and nice. Towel and breakfast included. Wonderful place to stay in Plovdiv! The flat is completly new, big new bathroom, new comfortable mattresses. Breakfast is delicious and the owner is really a nice guy. He is very helpful and give you excellent advice for walking tours in town, restaurants and whatever you want to know. Wifi is very reliable. definitly the place to stay in Plovdiv! 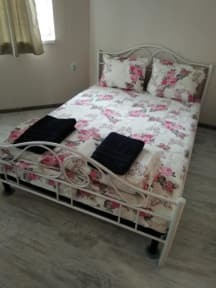 clean dorm rooms, comfortable mattress, awesome modern bathroom kept clean, kitchen is small to share with the number of guests that stay here but is well supplied. a good breakfast is prepared by the hosts and additional seating is available outside. great location in the city i would recommend it to a friend and would stay here again. I only stayed one night, but I would have stayed more if I had more time. Really small hostel with a 6-bed dorm and a room with two beds. Looks like it's been entirely renovated, the shower is big. They have lockers with keys. A terrace... The breakfast was fine. Overall a good experience. The staff is nice and the location is okay.